Some while back I ventured on to one of the frequent threads on Etsy "What do you think of this avatar?" My meerkat was mistaken for a dachshund! Excellent, I thought, that's my next project then. I thought at first that I wouldn't need to do much more than turn my meerkat sideways, but that didn't work quite as well as I'd hoped! I googled some pictures and set to work. I changed the angle of the legs, changed the increasing for his head so that it wasn't so central on the neck, and angled the tail. Not quite there yet. I could see the body needed to be longer, and somehow it just didn't look quite right. I started looking out for dachshunds on my daily walks! I needed expert advice, so went back to Etsy forums and discovered there is actually an Etsy team for Dachshund lovers! Clearly these were the folk to ask for help. I sent a message to SassySashadoxie and she was kind enough to send me lots of photos of Sasha. 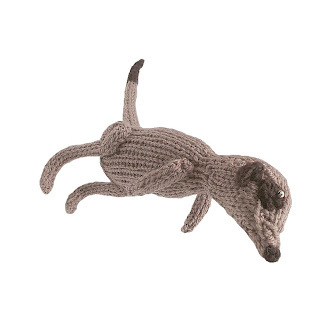 Another Etsian, Covetables, told me that dachshunds have waists and that was the next addition to my pattern. 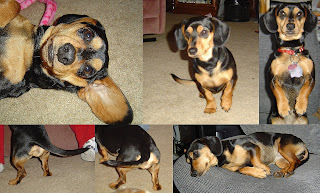 I now had a dachshund I was happy with, and listed a few. But I was still well aware that I wanted to go further. Sasha, you will recall, is part black, part tan. I sat and stared at my prototype for a while, working out how many stitches needed to be each colour, and set to work once more, referring frequently to my Sasha gallery. My next pup had a very rumpled tummy, due to carrying the black yarn across the back of the tan. I like to knit "in the round" on 4 needles, but working with four needles and two colours of wool at the same time was clearly not conducive to mental health (or to a smooth doggy tummy) so I went back to my pattern once more to make it work on two needles. After several attempts, we got there! ears: black on top, tan below? CHECK! tan on underside of tail? CHECK! Want one? check them out here! Sasha is so honored to be the model for your latest creation. We love it by the way. Wishing you lots of sales. Athena and Sasha. Those are so cute! I love the evolution of the two. I love seeing the development of your dachsunds. And the finished Sasha is so cute! I love your little dogs. And I love the meerkat too. You do such a great job on your animals, and the dogs are no exception. Yay! What a brilliant post, I wonder what Darwin would have made of it? That's one cute dachshund ^_^ It looks so well! Again, I still have to get my head around knitting 3D! One day, I will achieve it. Now that looks like a dachshund! 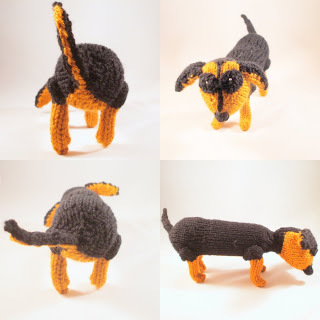 That's really interesting to see how your daschund design has evolved from your meerkat design - they are gorgeous and I hope you get loads of sales! Okay so I know I just asked if you did doxies in another post, but I found them on your etsy! Too cute!! And I love the ones in this post!